Take a look at the map above. 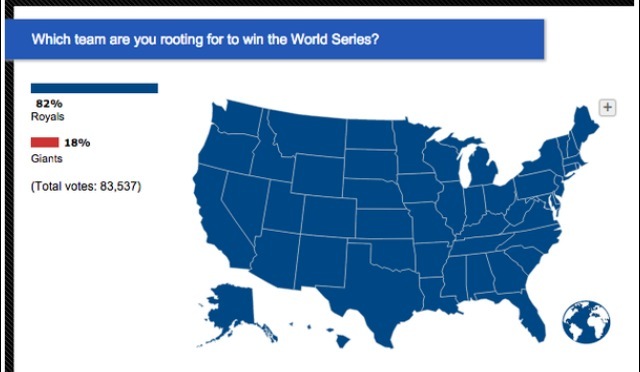 It is from an ESPN survey of baseball fans asking them which team they are rooting for. The blue states are rooting for the Royals fans. The red ones are pulling for the San Francisco Giants. That’s pretty cut and dry who most people are rooting for. The Giants are indeed the bad guys in the 2014 World Series. Relish it, Giants Fans. Also, what the hell was going on with Tim Lincecum? Is there a behind the scenes rift? It is the Game 1 of the World Series episode of The Sully Baseball Daily Podcast. This entry was posted in James Shields, Sully Baseball Daily Podcast, Tim Lincecum and tagged 2014 World series, Bruce Bochy, Hunter Pence, Kansas City Royals, Kauffman Stadium, Madison Bumgarner, Paul francis sullivan, San Francisco Giants, sully baseball odcast, sully baseball on sound cloud, Sully Baseball Podcast. Bookmark the permalink.